Conrad reminded me that I had proposed to make a list of the best 100 sculptures of all time. Now if I had to choose just one sculpture to place just outside my Cave or Castle it would be Stephan Sidling Valkurie above. This should fix the message that only serious, brave lovers of Fine Art should enter! As well as the old, the odd, the beautiful, the ideal, and the “down right bloody wonderful” I have included young people. Not surprisingly as my life up to now has largely been to father and nurture four wonderful offspring. It must be said that my taste is more traditional that my contemporaries. Let’s go back a bit to Moore and Hepworth, they were interested in new form, but I am interested in recognisable form, or meaningful Art. Frink I find a little spooky and unnerving but not frightening and certainly not beautiful but with some merit in making one feel uncomfortable. Now Eric Gill is sometimes like the motorist who slows down to look at the gory accident on the other side of the motorway. I feel that there is a distinction between art, monument and ornament. As far as possible I will post Art, again carefully considering Art versus raw monument. I have included a few works that others find particularly good and I dislike, no prizes for guessing right! A statue to a great person could be great Art but to my mind it probably isn’t. Abstract works are not included. I do not intend to include origin, location, date of conception, or the sculptor’s name. If the viewer needs to know they may ask. This is due to available time and some to some degree ignorance on my part! 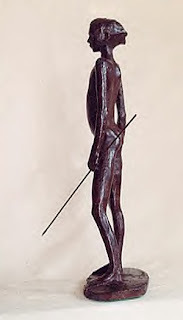 I am not principally interested in promoting a sculptor only Great Art. or as in “the human figure”.”. I will choose the best photographs I can find and give credits where possible. If I have used your picture without permission I am very sorry and will remove it immediately or add your link and credits. I will add one at a time in no particular order. Anonymous comments will be accepted but may be deleted if considered inappropriate by me. It is hoped that this will gradually develop into a most popular list. Anyone who wishes to submit a work may do so as a link on a comment. If accepted will be added to the list with a note of who suggested it, (optional). I will add some labels in due course for catagories. The best are rated "five star". So now I hope you are prepared for what follows. Sculptor. I enjoy my work, realising commissions and creating new projects of my own.